When bosses at Leicester railway station decided the site was in need of a multi-million-pound overhaul, they knew which commercial glass supplier to turn to. 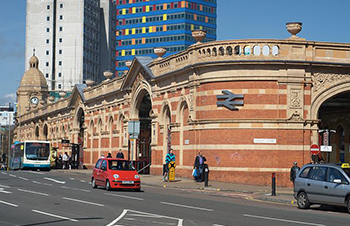 The station is a well-loved landmark of the city, with the original distinctive red and buff stone frontage dating back to late Victorian era. But the entrance, ticket office, concourse and platforms were all in need of extensive improvement and refurbishment works, which would be funded by Network Rail, East Midlands Trains and the National Stations Improvement Programme. 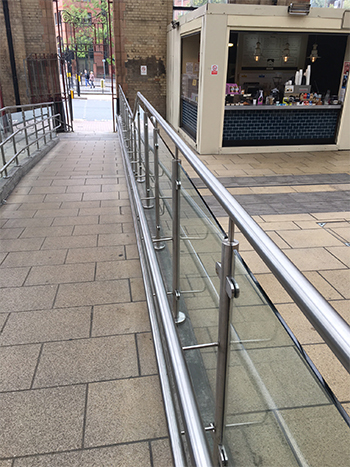 Tufwell Glass was brought on board to supply and install a stylish new glass balustrade system for the ramp at the station’s main entrance, enabling safe wheelchair access to the concourse. The primary objective for the new glass balustrade was to facilitate safe and easy passage through the station for wheelchair users. And of course, the design should be contemporary and in keeping with the overall look of the revamped building. It was decided that 10mm toughened glass would be the optimum product for the glass balustrade’s infill panels. 10mm toughened glass strikes the perfect balance between strength and manageability for the size of the panels that were required. The supporting structure of the glass balustrade was to be stainless steel, giving it a contemporary appearance with the added benefits of durability, strength and, most importantly, flexible accessibility. To aid wheelchair users, additional low-level rails were included in the glass balustrade frame’s structure. The end result is a glass balustrade system that will serve the station’s users well for many years to come. Find out more about the range of glass balustrades Tufwell Glass can supply here, or get in touch with the sales team directly to discuss your options.